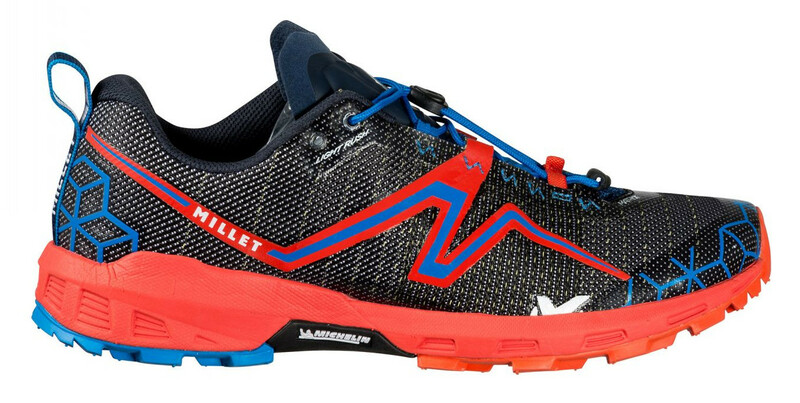 A new ultra-light shoe engineered for trail-running performance. Weighing just 260g, it features the latest Michelin outsole, developed exclusively with MILLET, which ensure responsive grip on all types of terrain. Its Matryx® fabric enhances abrasion resistance and prevents deformation, while delivery optimal breathability. Does the business for intense up/down and short sessions, providing perfect alpine-running sensations. EVA midsole with anti-shock insert enhances the dynamic response of the shoe, It gives bounce and comfort without adding weight. MATRYX® fabric is a weave of nylon and Kevlar yarns. It retains the foot, breathes well and is highly abrasion resistant. The water-repellent PU coating of the yarns improves moisture wicking and quickens drying. Developed specially with and for Millet, this new outsole is inspired by MICHELIN and its know-how in mountain-bike tires. Thanks to its structure and materials, this outsole delivers excellent traction and adaptability on a range of terrains.